Osoby dosle do Terezina z ruznych uzemi, prezily v Terezine podle publikace MSP, repatr. odbar: ,,Terezin-ghetto"
USTREDNI CARD INDEX - TRANSPORTY. 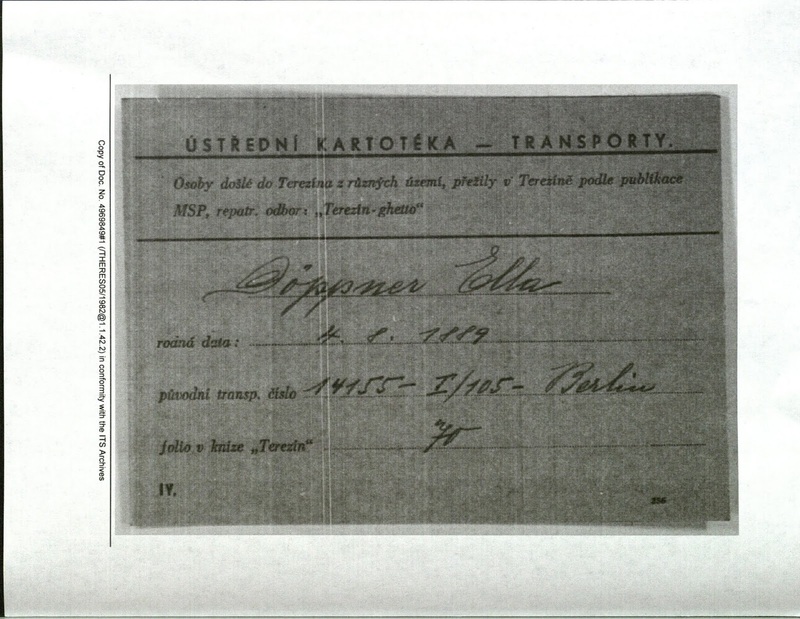 People arrive at Terezin from different countries, according to the report by the Ministry of Transport, repatriated in Terezín. odbar: ,, Terezin-ghetto "
This is the blog I've been dreading. Ella's deportation. I have a lot to share with you, and I don't even know where to begin. 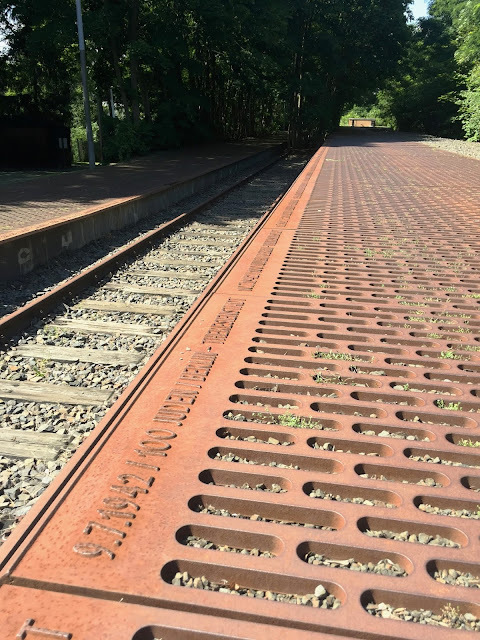 I think I'll share with you what Renate told me of the day the Gestapo took Ella to the holding place (the sort of way-station ghetto in the city where people were contained until they could be sorted into groups for deportation). Yes, at that time I was a very little girl, and everything I know about Ella was told to me by my parents, mostly by my mother. I have only vague memories of her, and they are full of very loving, tender and warm feelings. When we could not visit Aunt Ella anymore, I always asked for her and missed her very much. That is one thing I can remember myself. Ella was the favorite sister of my father. 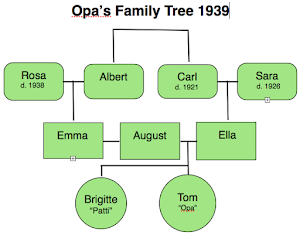 To the other 2 siblings (Martha who was married to Erich Stier later on) and Walter (who was killed during the 1st world war) he did not have such close ties. 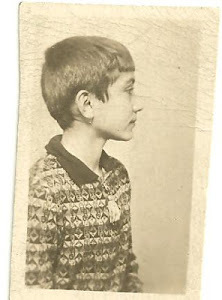 Ella was the only one of the Fraustaedter family who knew that her brother Kurt had a connection with my mother. (Marriage between Jews and Aryans was forbidden as Race desecration, and punishable by law) and that I was his daughter. My mother on a family visit to Ella, was always introduced as one of her pupils (Ella tutored...) under a false name, just in case somebody might say the wrong thing. On the day Ella was picked up by the Gestapo, my mother happened to go there, since she had planned to meet her. 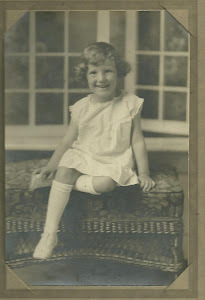 I was dropped off at Mrs. Ruhstadt’s (the neighbor) and only felt the excitement, and as the Gestapo had left, and only the jewish guard was in the apartment, my mother helped Ella pack up the few belongings she was allowed to take. Ella was totally distraught and naturally full of fear and despair. She was sent to a so-called exit-camp on Grosse Hamburger street in Berlin, and from there she was deported to Theresienstadt. This is the only first-hand account we have of Ella's arrest. It is of course filtered through the memory of a 5 year old and the re-telling by her mother. However, it feels pretty accurate, as it echoes the stories of other arrests. Something Renate mentioned in this letter was the presence of a Jewish guard. I did not understand this until I was given more information. Some Jews were appointed as guards or sort of leaders in their location. They kept the peace, kept people compliant, in return they and their family might receive preferential treatment and protection. This worked for some of them, but not all. When I visited Berlin, I went to Grosse-Hamburger street to see where Ella was first taken. This mini-ghetto on a side alley was home to a Jewish cemetery and a sort of retirement home for elderly Jews. At the time Ella was taken to the area, the cemetery had been razed by the Nazis, creating a flat area with hidden souls now unmarked. The home cleared of all residents. Now it was a dumping ground for unwanted Jews, to hold them like inventory waiting for shipment. When Ella was taken to this place, it was January- maybe December. January 10th was her deportation date, the day she left the train station. I don't know the date of her arrest. Ella came to this flattened graveyard to sit with her unfamiliar neighbors in the cold of a Berlin winter, waiting for whatever was next. This is the view of the flat grounds of the cemetery from the entrance. This is a memorial for the Jews who were brought to this ghetto. In the background you can see the gated cemetery grounds covered in a thick carpet of periwinkle, gravestones eerily missing. 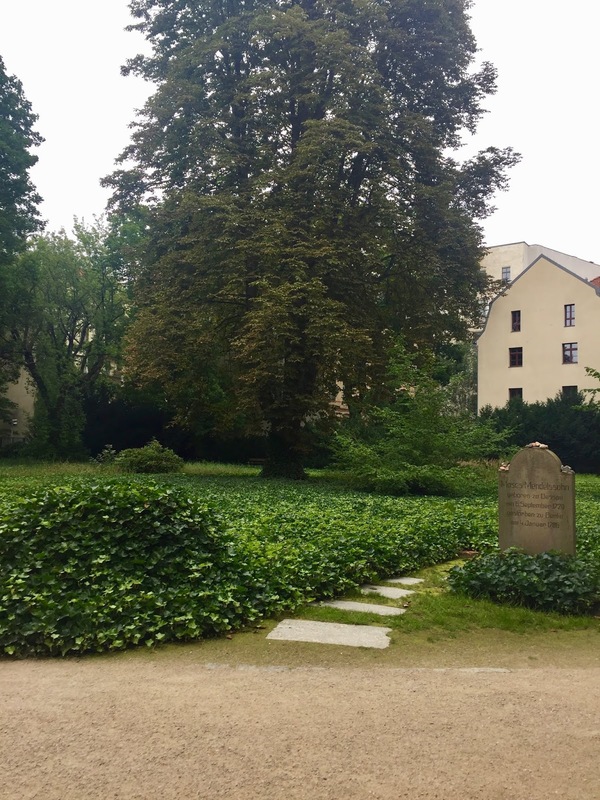 It was a Nazi habit to raze Jewish gravesites and destroy evidence of Jewish life, even their death. The platform row representing Ella's deportation transport. Remember the Europeans date things by Day, Month, Year. So January 10th, 1944. From the Fall of 1943 onwards, the deportation of the remaining Jews from Berlin to Theresienstadt was carried out amid heavy aerial bombings (“The Battle of Berlin”). Allied air strikes caused severe damage to the German capital’s infrastructure and to the Nazi Security Services facilities. Under these circumstances it was difficult to organize transports, but they did not cease. This is interesting to note, there was a bombing mid-December that greatly affected railroads, which might explain why Ella's transport left from a different location. However, unfortunately it did not end deportations. Ella's time in the exit-camp and during transport was not accompanied by any major air raids. The bombings in December and January were December 17th, and then the next was January 28-29. These were the major bombings, I'm not sure if there were smaller ones in between. Time really was a precious commodity. The quicker the Allies could win, the better chance the remaining Jews had of survival. 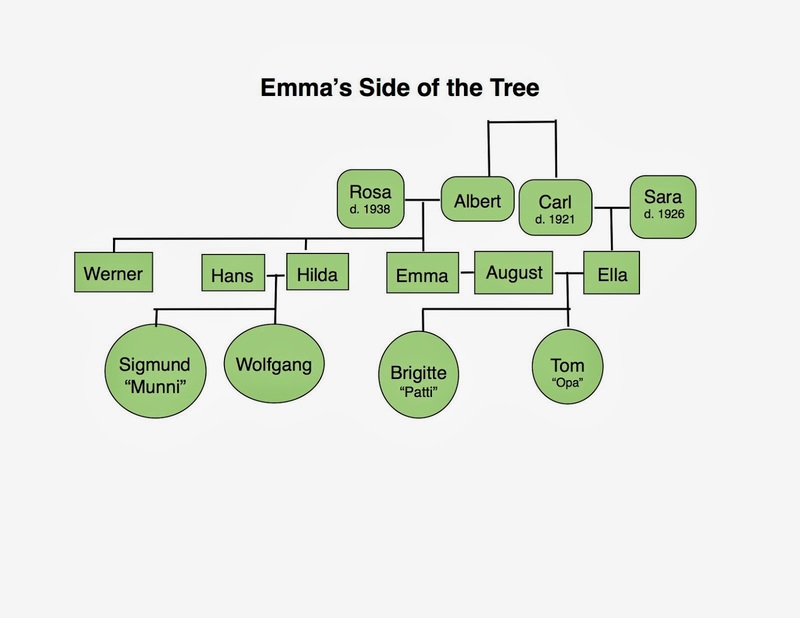 This is very interesting to me, as it helps explain why Ella was able to "hide" in plain sight in Berlin for so long. Her marriage (though divorced) to August, an "Aryan," was a protective connection. Although marriage between Aryans and Jews were forbidden, and frequently encouraged to dissolve, some couples kept it together and somehow managed to be low on the priority list for the Gestapo. Those who divorced legally out of fear of retribution, may have still been together. The Nazis knew this and kept this tangle on the back-burner. Any Aryan connection meant that someone of "importance" was paying attention to that Jewish life. Of course this was not an air-tight seal of protection, but it did the trick for many for a long time. In December of 1943, the exemptions got smaller and smaller, and Ella's luck ran out. The vast majority of (the transport) were patients of neurological wards from all over Germany who had been brought to Berlin. The transport also included divorced Jews from mixed marriages or Jews whose Aryan partner had died. The procedure of dispatching the transport was different from the smaller transports. From the assembly camp the deportees were taken with trucks to the train station, where they had to wait for hours until everyone was registered and counted. This procedure lasted from the afternoon until the evening, when the train left Berlin. They traveled all night long and arrived the next morning in Theresienstadt. Ella's train mercifully took a fairly straight shot and did not endure some of the stops for hours and days that other trains did. There were 352 or 353 Jews on this transport (the number varies depending on the source). That's the information. Now to process it. It is impossible, right? My husband and I have a way of talking about things that are hard to let go of, hard to process- we say we have trouble letting it filter through. It sits in our brain, in our guts. We ruminate about it, and it churns in our stomach, percolating but not filtering. This, Ella's deportation, it doesn't filter. The woman whose letters I have been reading, full of love and yearning for her children, she is deported. She's lumped in with the rest on a train like we learned about in school. These massive stories of horror have a built-in safety. The sheer mass of numbers gives us the ability to pass it by, to not have access because it is so impersonal and too big for us to grab a hold of. But Ella. I can grab her letters, predict her questions and laugh at her chiding Opa to keep his hands out of his pocket when he has a picture taken. Ella brings the masses into focus. She is a person that in many ways, I *know*, and her insertion into this massive story means that I can no longer hold it at arms length. Now I'm tangled in it, swirling in the whirlpool of souls that all had stories and personalities and hopes and faults and dreams and quirks. Now she has brought a microscope to the holocaust, I am forced to look closer and see what is there. I am forced to feel it instead of read it. My heart hurts, literally right now I feel a pain. My gut is tight. My brain is murky. Ella, Mama, my great-grandmother, is deported on January 10, 1944. I am so sorry. This feels like a death in my own family. I think we all knew you'd have to post this eventually and I purposely refused to 'see' any reference to Ella not surviving when it might have been hinted at in other posts. Now my fear is to see how this affects Tom. I'm not looking forward to that, either. Thanks again for sharing these soul-wrenching stories from your family history. I will forever remember the opening lines of her letters. God bless. Her deportation is indeed heartbreaking, but she did survive the deportation.